A WAITRESS HAS been awarded €2,000 in compensation after she was sacked following a negative review on the TripAdvisor listing for the restaurant where she worked. 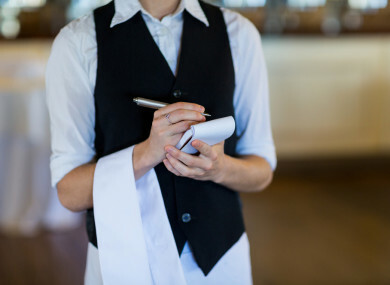 At a recent Workplace Relations Commission (WRC) hearing, the woman said she was dismissed after a customer complained on the user-sourced review site that “the red-haired waitress was abrupt”. She said she was fired with immediate effect as a result of the “alleged adverse comments” and was not offered any process to appeal the decision of her employer. The restaurant owner argued that he had received numerous complaints about the waitress in addition to the TripAdvisor comment. These included two other complaints from customers and around 20 complaints from staff. However, he admitted that he did not inform the waitress about these other complaints and apologised for his behaviour. In its anonymised decision, the WRC said that the comment on TripAdvisor, which was used as the reason to dismiss the waitress, was “very far removed from the concept of substantial grounds for dismissal” under unfair-dismissal laws. It added that the use of this comment plus the alleged complaints by fellow employees to fire the waitress was “not far short of mob rule in the workplace” as there was no opportunity to examine the truth of the claims. The WRC concluded that the waitress’s complaint was well founded and that she should be awarded €2,000 in compensation. At the hearing, the waitress said that she had worked at the restaurant for a year and a half but had not been provided with a contract. She claimed that after the dismissal her employer offered to pay her minimum notice period but only if she signed a statement saying that she would take no further action. She refused to do this as she did not wish to compromise her case for unfair dismissal. The restaurant owner responded that since she submitted her complaint the waitress has been paid her notice. Overall, the WRC stated that there was no disciplinary procedure, no advance notice, no examination of the alleged complaints or no opportunity to appeal the dismissal. As a result, it stated that there was no substantial grounds to warrant the dismissal. Email “A waitress who was sacked over a bad TripAdvisor review has been awarded €2,000”. Feedback on “A waitress who was sacked over a bad TripAdvisor review has been awarded €2,000”.